Food recalls, contamination, problems in the "food supply"--these are fairly common news items these days. It is unfortunate, to say the least. I wasn't even going to comment on the latest salmonella outbreak, but the story of billions of eggs being recalled remains at the top of the newscast. I wasn't going to comment because we have been here before. In fact, if you dig a little deeper you'll find recalls and questions about our food safety are being raised all of the time. This time it is eggs--but remember the spinach scare of 2006? Did you miss the spinach recall last month? Beef, chicken, pork--they've had their day too. But here's what really got me: when I heard the story being pitched as a problem with the FDA and our system of inspection I nearly lost it. The problem isn't whether we have enough inspectors to catch the problems in the food supply--the problem IS the food supply. As commenters on my previous post have stated--we are so glad we have access to good local eggs. Many of us, even when not purchasing eggs produced by organic feed supplemented, pasture raised hens, have access to, and can afford to buy local eggs. Why would we buy eggs from Iowa? Why would we think confinement factory chickens would only produce problems concerning meat chickens and not the eggs laid by the hens? I know that buying local eggs is no guarantee against food-borne illness. But I also have the email addresses and phone numbers of the three farms that produce the eggs I usually purchase so if there ever was to be a problem it wouldn't take too long to get to the bottom of it. I just have to wonder, how many recalls, sick people, and wasted food will we have to endure before we realize that our "conventional" food system isn't working? Small family farms--as much as I rely on them--aren't the total answer to feeding the voracious American appetite either, but between these two poles there has to be a better way. After just catching up with Tuesday's Syracuse Post-Standard newspaper, I am sitting here doing deep breathing exercises to control my frustration. Don't eat any spinach from a garden. Don't eat any spinach from local growers. Don't eat any fresh spinach--period. That's the message that Onondaga County Health Commissioner Cynthia Morrow and FDA emphasized Monday. I read on, waiting for the punch line...but there was none. Apparently on Sunday the FDA had increased the spinach recall to include all fresh spinach--not just the prepackaged kind. Somehow I missed that. I hardly know where to begin. Well how about here: why would I trust the FDA to tell me not to eat the spinach growing behind my house that I've been lovingly tending throughout the growing season? I'm just trying to operate with a little common sense here. I understand that the known facts were few earlier this week, but why would I worry about locally grown spinach (if we could get it at this time of year) when there wasn't any evidence of people getting sick from locally or garden grown spinach? And while I appreciate Pam Greene's reporting of the warning, she would have done well to flesh out the information a little more. I want to know WHY my garden spinach should not be eaten? Now of course, we are in a different place then we were Sunday or even Tuesday, and have a better understanding of the source of the E.coli problem--I'm still waiting for the big headline telling me it's okay to eat MY spinach. Okay, I'm being a bit cheeky here but I hope you get my point. As an aside, allow me to mention that yesterday's Post-Standard Business section led with a story that Few Farmers in CNY Grow Spinach; Crop Has Shrunk. Now I don't know those statistics but it is interesting that Bobbie Harrison from the Cornell Cooperative Extension is quoted as saying, that so few grow spinach locally that he couldn't name a single farmer who planted the crop. I can and it's not my job to know. A cursory search on the Local Harvest site reveals several farms in our area growing spinach--I believe our beloved Green Rabbit is one of them. But I digress. This whole spinach episode is a case of the worst kind of fear-mongering. It is not helpful to tell folks not to let local spinach touch their lips without giving solid reasoning. A few sentences explaining the connection between California-produced bagged spinach and the local CNY soil based spinach crop would have done us a great service. And if that connection can't be made DON'T TELL ME NOT TO EAT THE FOOD I GROW! Furthermore, if the FDA really wants to protect the public from possibly tainted food, it might begin by putting appropriate warning lables on the industrial agriculture/factory-produced poultry and meat, and pesticide laden produce that pass for groceries in most supermarkets. THAT would be doing the public a favor. Okay--I'm putting away my soapbox now. For some solid information about growing prepackaged spinach, read this piece by an organic farmer in California from Chez Pim's blog. Thanks to Jen at Life Begins at 30 for alerting us to this post. Also, check out the great letter Stefanie from Couteau Bonswan wrote to the local media. why is it so difficult to trace the source of the problem? what does it mean that so many brands rely on so few producers for their spinach crop or that one company packages so many brands? why, especially here in CNY, are folks not being urged to purchase spinach from local farmers or, better yet, to grow their own? This issue is near and dear to my heart because the first food I ever grew was spinach. After moving to Johnson City in the late 90's after living in Berkeley, CA for three years where elaborate spinach salads (yes, made with bagged spinach) were the mainstay of my meals I found that said bagged spinach was difficult to find year 'round at the Johnson City Wegmans down the hill from me. So I purchased two very long planters, carved out some space on my little apartment balcony, and began to grow my own. I've been growing it ever since. The thing about this food safety scare is that the media don't seem to be raising the issue of the vulnerability to our food supply when it is so largely centralized. Despite the nice photos on websites depicting family farms, the majority of conventional and organic bagged spinach sold in this country is produced in California and Mexico--which is pretty odd when you think of how well spinach does when there is a little chill in the air. If we get over the idea that spinach is a year-round crop (and yeah, it took me awhile to get there) then we would find that it is perfect seasonal produce for our area. In the end, I don't think this is one we should take laying down. We have an opportunity to question the USDA, Natural Selection Foods (the folks who recalled their spinach) and our federal government and demand greater transparency about our food supply. Kate, over at Accidental Hedonist, is keeping close tabs on this story as it develops. 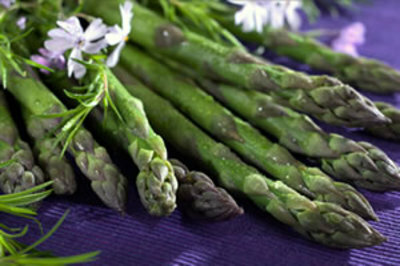 We know asparagus is not in season right now but if you see it in the produce aisle of your grocery store--doesn't matter what time of year--chances are pretty high that it came from Peru. Little progress has made in establishing nation-wide and mandatory country of origin labeling (COOL) for produce. COOL legislation is becoming more important than ever as a new phenomenon takes hold: the outsourcing of farming. It has been reported that many essential crops are being farmed in foreign countries and imported here as a cheaper alternative to the food grown here in the states. I'm sorry, I didn't think it was possible to pay farmers any less. The issues this raises for food justice, food safety, and the environmental impact of flying food across the ocean that could easily be grown right here are huge. Don't get me started. Read about it here. In a post last week I mentioned the issue of genetically engineered food. It is a topic that is generating much controversy these days--and for good reason. Proponents of genetically engineered (GE) foods, aka genetically modified organisms (GMO) say that by changing the genetic structure of many foods we have the ability to make vegetables resistent to herbicides--such as Round Up. GE foods can also allow crops such as potatoes to grow dependably even in weakened soil structures--thus guaranteeing the world of millions of fast food french fries. And many see GE foods as having the potential to solve the problems of hunger and starvation across the globe because food can be engineered to be produced in places that it would not have grown under natural circumstances. On the other hand, the jury is still out on whether eating GE foods is healthy and safe for the human body. Very little testing has been done. For those who are trying to eat organically and sustainably, GE foods present a large problem. In addition to the health issues, GE food production doesn't rely as heavily on healthy soil so it becomes that much easier to continue to ravage the environment. GE seeds and pollen are easily spread to other crops thus contaminating fields where GE foods were not desired. Monsanto, a large producer of GE foods has even sued farmers who were unintentionally growing their patented GE vegetables when the seeds blew onto their fields. For this reason places like Mendocino County in California have legislated themselves as GE-free. Additionally, many are concerned that as we become more dependent on the reliability of GE foods we will continue to see a decrease in the variety of foods that are grown. Currently there is a campaign to demand that foods that are genetically engineered be labeled as such. Given the prevalence of GE foods labeling would be a great help to those who are trying to avoid them. This Wednesday, June 15, is lobby day to Regulate GMOs at the New York State Capitol in Albany. Co-ops, organic advocates, and other concerned groups of citizens will gather for a day of lobbying and education in an effort to get New York State to require labeleing of GE/GMO foods. The films, The Future of Food and Hidden Dangers in Kids' Meals will be shown and books and other materials about GMOs will be on display. Folks will gather at the Legislative Office Building at 10:30 a.m. If you have the day to spare or even half a day, please come out to Albany. Until labeling becomes a legal requirement we will have to do the next best thing: ask questions about where your food is coming from and how it is grown; and as much as possible, by it from local, organic or no-spray farmers who hold the preservation of a safe food supply and human and environmental health as core conerns.